We are interested in understanding and elucidating protein-protein interactions (PPIs) and protein surfaces, in interrogating their ligandability i.e. propensity to bind strongly to small molecules, and in exploiting protein-protein and protein-ligand molecular recognition to develop novel small molecules that modulate biological systems. Of particular interest are protein interfaces recognizing protein Post-Translational Modifications (PTMs). 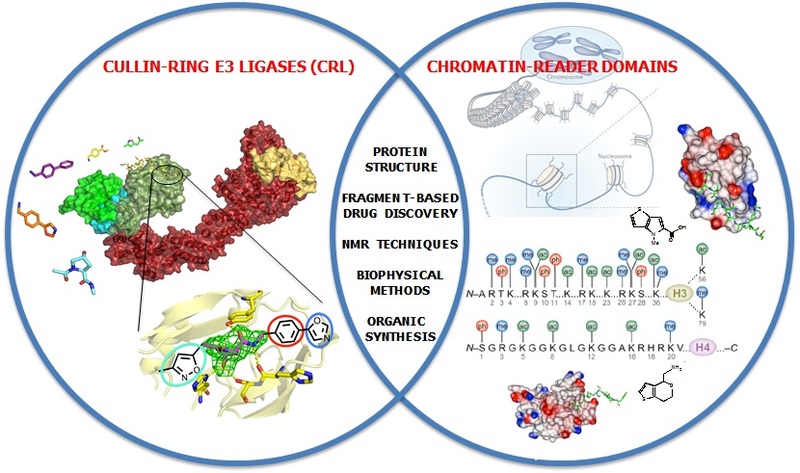 We are presently focusing on PPIs and PTM recognition within two protein families of biological and medical relevance within the ubiquitin and chromatin systems: the Cullin RING E3 ubiquitin ligases (CRLs) and a family of proteins containing paired chromatin-reader domains. We seek to understand the chemical nature of the surfaces and intersubunit interfaces of these proteins, and to exploit their tractability and selectivity toward small molecule modulation. The small molecules, aka 'chemical probes', that we design and develop in the lab are evaluated as tool compounds biophysically, structurally and inside living cells, and their potential to be developed into lead compounds to treat disease is harnessed and exploited.